Difference between revisions of "Carbohydrate Binding Module Family 80"
CBM80 is a small bacterial CBM family comprising around 96 amino acids and identified in the Ruminococcus flavefaciens cellulosome . The only characterized CBM80 modules are CBM80RfGH5-1/2 and CBM80RfGH5, which are components of enzymes containing catalytic modules derived from GH5_4 (CAZy - GH5_4) and GH5_7 (CAZy - GH5_7) for CBM80RfGH5-1/2 and GH5_4 (CAZy - GH5_4) for CBM80RfGH5 . CBM80RfGH5-1/2 and CBM80RfGH5 display specificity for β-1,4- and mixed linked β-1,3-1,4-glucans, while CBM80RfGH5-1/2 also binds β-1,4-mannans . CBM80RfGH5-1/2 binds galactomannan in addition to the β-glucans with affinities in the range of 104 M-1 to 105 M-1 . The endo-mode of binding to soluble polysaccharide indicates that CBM80 is a type B CBM . The key residues implicated in CBM80RfGH5-1/2 ligand binding were identified by site-direct mutagenesis (Figure 1) . Alanine substitution of Trp453 and Trp489 revealed a complete abrogation of binding to β-glucans and β-mannans, showing the importance of tryptophan residues in ligand recognition . CBMs that bind to β-1,4-glycans typically contain three aromatic residues that make apolar interactions with sugars . The predicted polar interactions between the protein and β-glycans have very little influence on affinity . Figure 1. Crystal structure of CBM80RfGH5-1/2. The residues that contribute to ligand recognition are shown. 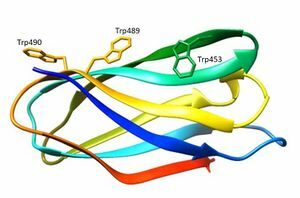 The three-dimensional structure of CBM80RfGH5-1/2 (5fu3) was solved using single-wavelength anomalous diffraction (SAD) methods and selenomethionyl labelled protein . The structure of CBM80RfGH5-1/2 (Figure 1) apo, and in complex with mannohexaose and cellohexaose, was solved with resolutions of 1.0 Å, 1.4 Å and 1.5 Å, respectively . CBM80RfGH5-1/2 has a β-sandwich fold consisting of two β-sheets (β-sheet 1 and 2) comprising of four anti-parallel β-strands each (Figure 1) . The β-sheet 2 of CBM80RfGH-5-1/2 presents a planar hydrophobic surface with a parallel orientation of Trp453 and Trp489 and a perpendicular orientation of a third aromatic residue, Trp490 . The mannohexaose CBM80RfGH5-1/2 complex revealed electron density for mannohexaose along the hydrophobic surface of β-sheet 2 . The structure of CBM80RfGH5-1/2 in complex with cellohexaose revealed electron density for only three glucose units . R. flavefaciens forms a multi-enzyme cellulosome complex that plays an integral role in the ability of this bacterium to degrade plant cell wall polysaccharides . CBM80 modules play an enzyme-targeting role in a highly complex scaffold that is specific to the Ruminococcus . CBM80RfGH5-1/2, a module in an enzyme that contains GH5_7 (CAZy - GH5_7) and GH5_4 catalytic modules (CAZy - GH5_4), binds β-glucans and β-mannans . Other examples of CBMs that recognize both β-1,4-glucans and β-1,4-mannans are found in families CBM16  and CBM29 . CBM80RfGH5, a module in an enzyme that contains a GH5_4 (CAZy - GH5_4) catalytic module, displays specificity for β-glucans . CBM80 from the Ruminococcus flavefaciens CBM80RfGH5-1/2 and CBM80RfGH5 . The first 3D crystal structure solved was CBM80RfGH5-1/2 . This page was last edited on 24 September 2018, at 02:41.